The lymphoid tissue in both caeca is organized into a well-developed tonsil that is located at the medial wall of the caeca where it piles out into the lumen. The tonsil consists of several tonsillar units, separated from each other by septa of connective tissue. Each tonsillar unit consists of a central crypt. 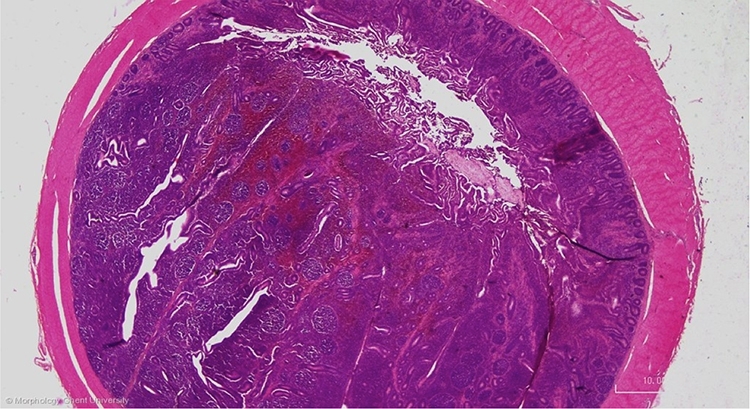 The lining epithelium is infiltrated with lymphocytes (lymphoepithelium) and the surrounding lamina propria and tela submucosa are infiltrated with diffuse lymphoid tissue and contain many lymphoid follicles.